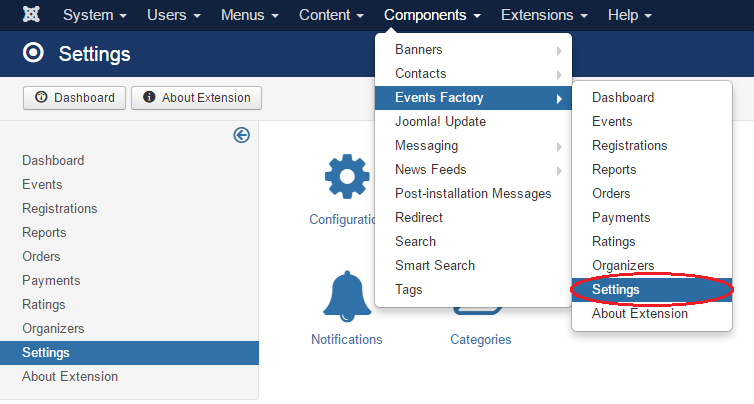 Events Factory is our Joomla! extension that provides the solution for scheduling events and online ticketing. 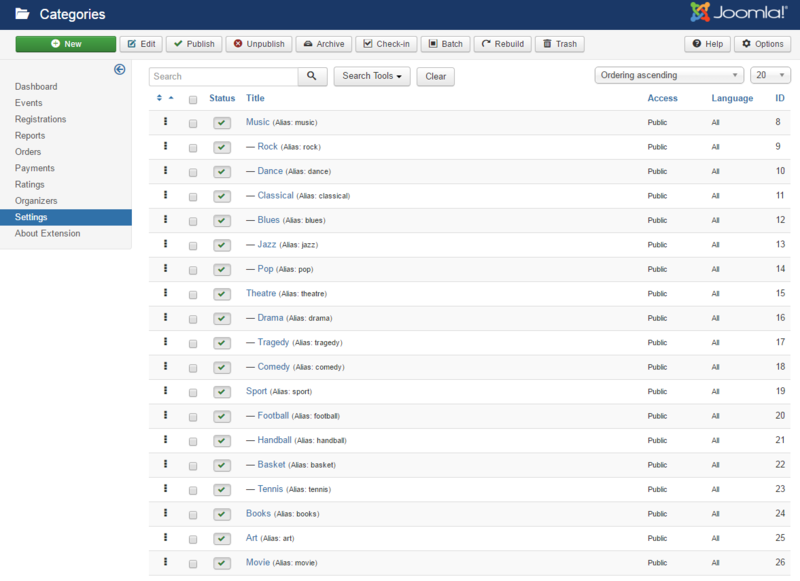 Once installed, you’ll notice the new Events Factory component item within your Joomla!’s backend. To access the Events Factory backend options go to Components→Events Factory→Settings. After doing so, go to Categories. In Options, you can choose the Alternative Layout(whis you usually set to Use Global.You can also set an image for the event,and that will appear in upcoming events within this category. In this tab you can modify the general settings like distance unit and the currency used. The next thing you can set is whether or not you want to approve the events. An event cannot be published if it wasn't approved beforehand. If you select Yes then the events will have to be approved by the site administrator and you can choose a group to be notified when an organizer submits an event for approval. The site administrator will accept or reject the event from the Approved status found in the Event→Details section. If you decide to decline the events, you must select No and the events will be published on your site once the organizers/managers request it. For more information about editing the events go to Events backend. Access the following page to set up a notification: Notifications. To have functional Google Maps and YouTube on your website you will need the API keys; to get one click on the following links: Get Google Maps API Key and Get YouTube API Key and follow the instructions found there. After you entered the APIs, you can set the default location and zoom. 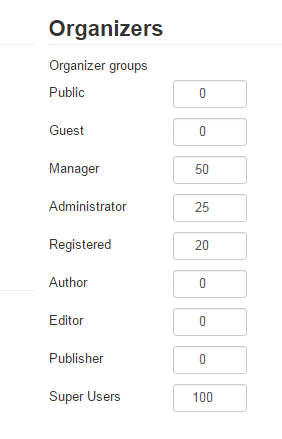 In this section, you can enter the maximum number of events that can be published by each member of the specified group. For example, if you enter 50 in the Manager's box then a manager will be able to publish up to 50 events. You can see the number of the published events (and the limit value entered) in section Settings→Organizers→column Events. Here you can reset the organized events for each organizer and set the value to 0, which will allow the organizer to publish again the maximum number of events which was set for his group. Recurring events are those events that occur more than once in regular intervals. Recurring events are very useful for creating multiple events using the same information. Please note that this feature is disabled by default. 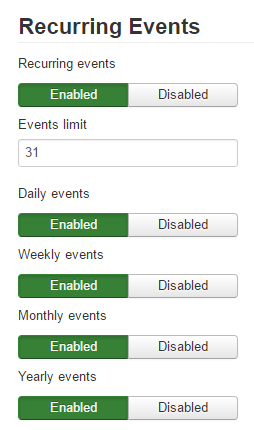 Here you can select if you enable to have recurring events on your site. 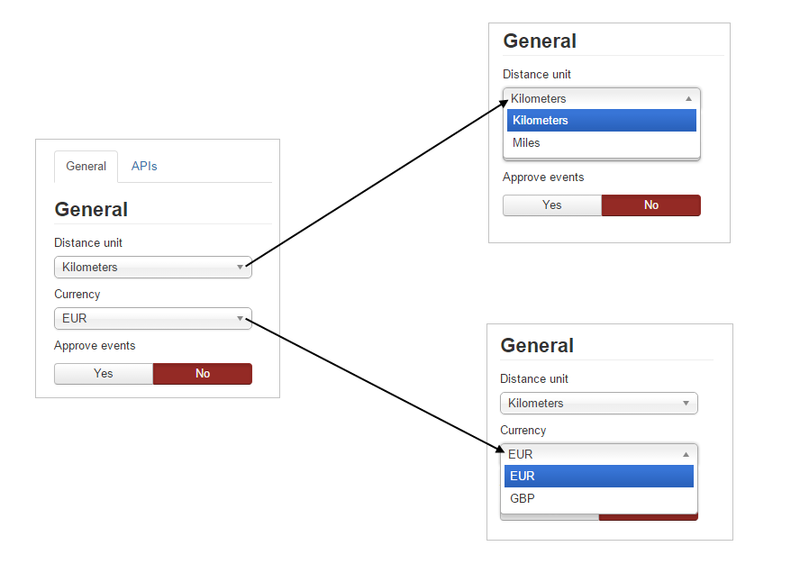 This option gives the possibility to multiply an event based on predefined rules. In the “Events limit” box you can enter the maximum number of repeated events, which means that an event cannot be multiplied more than this value. * Yearly events: this option allows to create repeated events on a yearly basis. Events Factory uses Joomla's category model, allowing unlimited levels of categories and subcategories, supporting a name, description, an ordering system, etc. To access this section, go to Components → Events Factory → Settings → Categories. 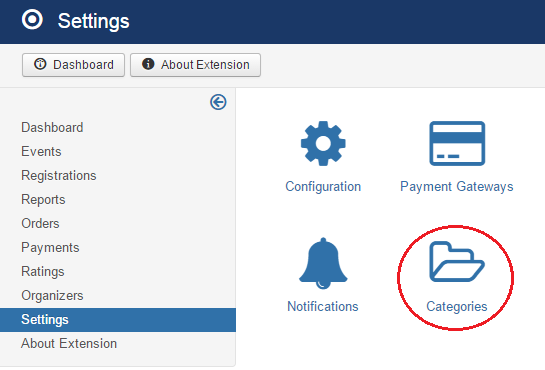 By going to Categories page, the administrator can view all the available categories and subcategories for events. If you open this section for the first time, you will notice that it's empty and you will need to add new categories. As available actions, the administrator can set their order, publish or unpublish them, add new categories, with their subcategories, edit existing categories, or just remove existing ones. 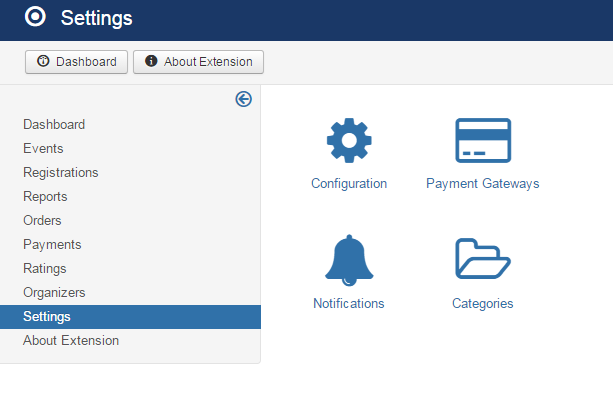 Along these, there are additional tabs which allows the administrator to configure the category even further. You can also set The Alternative Layout, which is usually set to Use Global, in order to have the same Layout everywhere on the page. The Image you will load will appear in upcoming events within this category. Alt text (alternative text) is a word or phrase that can be inserted as an attribute in an HTML (Hypertext Markup Language) document to tell Web site viewers the nature or contents of an image. The alt text appears in a blank box that would normally contain the image. Alt text is useful when an image link is not available because of a broken or changed URL or some other issue. These setting are auto-generated, and are also changed the moment you, for example, edit the category. Here you can set the permissions for different types of users, like Guests, Super users, etc. To save the new category or the changes made after editing, just press the "Save" or "Save & Close" or "Save & New", found at the top of the page. 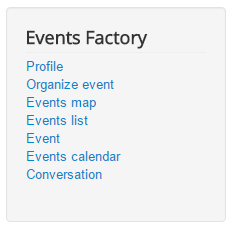 Events Factory's menu comes with many menu items that you can enable/disable or edit. * Profile – Shows the user's details, the events managed and booked. * Organize event – Opens a form where the user can add a new event. * Events map – Displays all the upcoming published events using Google Maps. * Events list – Displays the list with all the upcoming published events. * Event – Here it will be displayed an event which was selected by the site administrator from backend menu. * Events calendar – Displays all the upcoming published events on a calendar. * Conversation – Here you can see your conversations and also start new ones. All these menu items are more detailed in the next pages.